If you're looking for an affordable beginner's keyboard, by all means read on. The Yamaha YPT310, available as of Spring 2007, sells for about 149 bucks. Great for students and youngsters. Its features include 61 full size keys, 32 notes of polyphony, Yamaha Education Suite, a 2-track sequencer, Portable Grand, and stereo speakers with bass ports. The Yamaha YPT 310 also comes with 482 instrument voices, including 108 Standard, 361 XGLite Voices, 12 Drum Kits and a Sound Effect Kit. You can even download style data from the Internet thanks to the Style File Format or SFF. It comes with over 200 styles of music to choose from. There's also a headphone jack so you can practice in private. If you're buying your keyboard with piano in mind you need one that comes with expressive touch like a piano. On a piano, the harder you strike the keys, the louder the sound, and the softer you press the keys the softer the sound. The YPT310 comes with a touch response feature that replicates this. And if piano is so important to you, you will be delighted by the Portable Grand feature. With just one press of the button you get an amazing stereo grand piano voice. 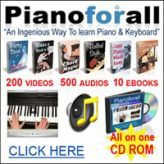 The entire keyboard goes in piano mode, perfect for when you're ready to practice. Like most portable Yamaha keyboards, the Yamaha YPT 310 comes with a feature called Yamaha Education Suite that actually teaches you how to play keyboard. It's always good to have a teacher when learning how to play an instrument. But what do you do when there's no teacher around? Well with the Y.E.S feature you can 'do it yourself'. 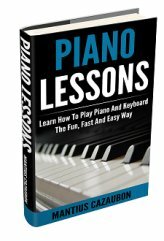 It comes with three lessons for each hand as well as Lesson Grading and a chord dictionary. There's a total of 100 built-in songs on the Yamaha YPT 310. Most beginner portable Yamaha keyboards come with computer connectivity. But the Yamaha YPT310 takes it one step further allowing you to download songs from the Internet into an internal Flash ROM. At the touch of a button you can be connected to music on the web and your computer. There's a MIDI port and an optional USB-MIDI Interface like the Yamaha UX16. And since the YPT 310 is General MIDI and XGlite compatible your song data will always play back correctly. All in all, a good beginners keyboard for the price. Learn more about the YPT 310 here. Be sure to compare it to others in its class before deciding as to whether or not it's right for you. Not sure what is right for you? Learn how to choose a keyboard here. Return from yamaha YPT310 review to home page.